I have many iTunes U videos that take a lot of space on my disk. I don't really need them on my disk but I would like to keep their reference in my iTunes U library so I can re-download them when needed. Delete the videos. Then right-click on the course title and select Show all available items. This will restore the complete list of available episodes. You can also do this by option-clicking on the disclosure arrow of the course. The arrow needs to be closed before option-clicking in order for this to work. Not the answer you're looking for? Browse other questions tagged itunes video itunes-u . Removing Files from iTunes Media? 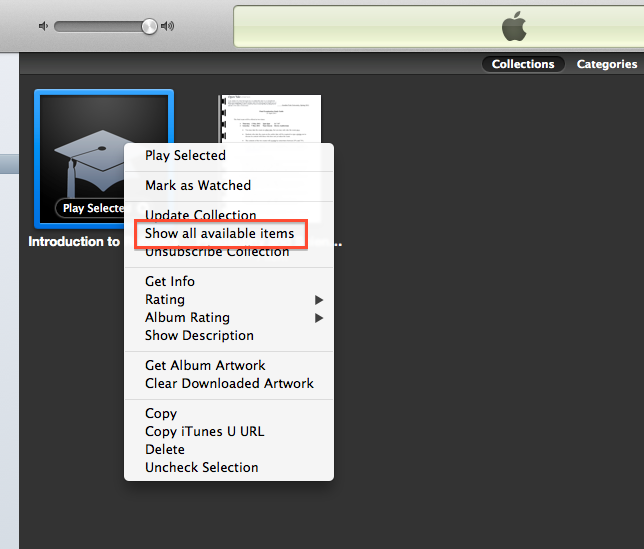 How can I play iTunes U videos on my iPhone?